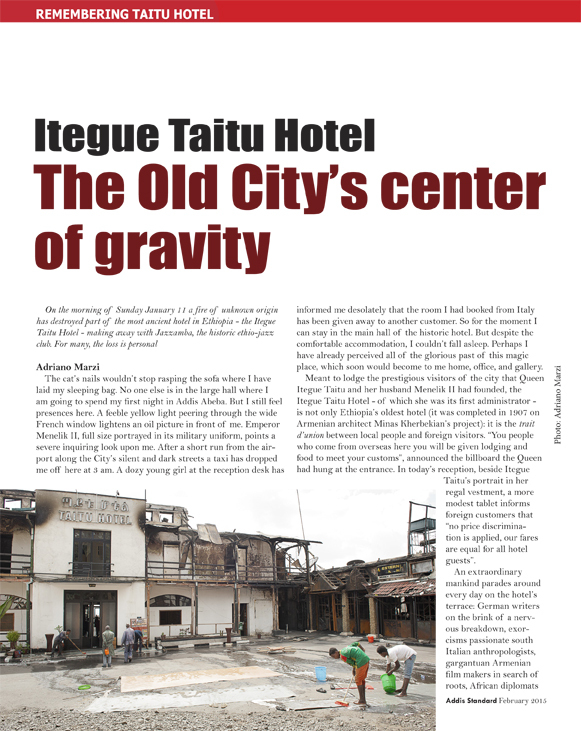 On the morning of Sunday January 11 a fire of unknown origin has destroyed part of the most ancient hotel in Ethiopia – the Itegue Taitu Hotel – making away with Jazzamba, the best Ethio-jazz club in Addis Ababa. Among the landmarks in Addis Ababa’s architectural and cultural heritage, these places are especially dear to me because here started my discovery of Ethiopia. It is in an infinitely sad state of mind that I am writing following note, in the auspice that these places will soon be back to their original splendor. The cat’s nails don’t stop rasping the sofa where I have laid my sleeping bag. No one else is in the large hall where I am going to spend my first night in Addis Ababa. But still I feel presences here. A feeble yellow light peering through the wide French window lightens an oil picture in front of me. Emperor Menelik II, full size portrayed in its wild military uniform, points a severe inquiring look upon me. After a short run from the airport along the City’s silent and dark streets a taxi has dropped me off here at 3 am. A dozy young girl at the reception desk has informed me desolately that the room I had booked from Italy has been given away to another customer. So for the moment I can stay in the main hall of the historical Taitu Hotel. But despite of the comfortable accommodation I can’t fall asleep. Perhaps I already perceive all of the glorious past of this magic place, which soon will become to me home, office, gallery. Meant to lodge the prestigious visitors of the City that Queen Itegue Taitu and her husband Menelik II had founded, the Taitu Hotel – of which the Queen was as well first administrator – is not only Ethiopia’s oldest hotel, completed in 1907 on Armenian architect Minas Kherbekian’s project. It is the trait d’union between local people and foreign visitors. “You people who come from overseas here you will be given lodging and food to meet your customs” announced the billboard the Queen had hung at the entrance. In today’s reception, beside Itegue Taitu’s portrait in her regal vestment, a more modest tablet informs foreign customers that “no price discrimination is applied, our fares are equal for all hotel guests”. An extraordinary mankind parades around every day on the hotel’s terrace: German writers on the brink of a nervous breakdown, exorcisms passionate south Italian anthropologists, gargantuan Armenian film makers in search of roots, Dutch coffee-shop owners who need to brighten up their minds, circus managers, gold diggers, pretty young Ethiopian women hunting for a one-way air ticket to a Western country. To many of these characters the open-air café tables are the ideal place where to deal with their business and weigh the City’s external temperature from the wicker canopy’s fresh shelter. To others, as the Ethad-Air Captain Abdula Muhammod, it’s simply “the perfect place where to spend holiday time. I came to Taitu every year cause it’s a safe place where I can join peaceful and welcoming people from all over the World, breathe fresh air and eat organic food”. All around the terrace, in the flower beds peep out broccolis, cauliflowers, lettuce, beans, tomatoes. A “gardener” from Zimbabwe has converted the hotel’s green areas into vegetable gardens. A reality that has become part in the Slow Food “Thousand Gardens” project. Small room has been indeed left for flowers, but an excellent cheap “zero-kilometer” vegan lunch buffet is available daily at the hotel. The loving relation between Taitu and foreign writers has a long story. For William Boot – main character of Evelyn Waugh’ novel “Scoop” – the hotel was “a small sanctuary” in Ethiopia: “a serene and embracing place, where – during the Fascist occupation – the reporters drank, plotted, quarreled and borrowed each other’s toothbrushes”. The best place for war correspondents to be close to the local radio station where they could file their stories. The favorite place to spend their nights “singing bawdy songs around the Steinway piano”. The piano still be there, but today Taitu Hotel has expanded his musical offerings hosting one of the local music Pantheons. Part and parcel of the historical building, Jazzamba Lounge is the stage on which the best Ethio-jazz talents and Word-music rising stars perform: among the others Alemayeo Eshete, the Addis Acoustic Project, Samuel Yirga, Girma Negash. Old Ethiopian music lions and young global musicians perform side by side to find a synthesis of modernity and tradition through soul, rhytmn’blues and folk music. The Addis Ababa Social Club. Although less eye-catching than the graceless monolith known as “Arada building”, Taitu Hotel is the landmark which best represents Arada, the social life and economic City’s beating heart. The hotel compound is a permanent gravity center for tens of young people keen to guiding tourists through the major City’s attractions and helping meet all their needs. Just across the main entrance the never ending drama of Addis’ life is on play, with no intermission nor filter. Lepers wound in their putrid bandages dragging themselves along the street, begging drunken cripples, dogs and children sharing restaurants’ remains and dust, adolescent whores selling their bodies in front of the local police station. Living at Taitu means getting in touch with all these people, listening to their yammers and pleas, meeting their glances, brushing against their bodies violated by misery. Those who really have an interest in getting acquainted with this City won’t find any better place where to move from. For many travelers, like myself, Taitu has been home and family away from one’s own home and family. The hotel staff often adopt long-time guests and take care of them affectionately. I know persons who fallen ill have been assisted by room service personnel with no less attention than their own relatives would have paid. For most hotel personnel, the hotel not only is their workplace but the place where they live. Last Sunday’s fire putted them in trouble. They all deserve support and help, as attention and engagement by all the people who love this City deserves the reconstruction of one of Addis Ababa’s most important laical temples. Included by New York Times and Lonely Planet in the list of the 10 World’s Top Cities to visit, Addis Ababa is living an extraordinary transformation. Symbol of the African renaissance, the city is evolving at a very fast pace, experiencing a stable economic growth and a massive urban expansion. To make room for a new skyline worthy of a modern global capital, the City Administration has undertaken a big clearing program concerning lots of informal settlements – according to Un Habitat 80% of Addis surface is occupied by “slums” – whose inhabitants will be relocated to the new City’s suburb. But the rapid ascent to modernity of “the new Africa’s New York” might compromise his historical heritage, transforming the original “City forest” in a “concrete jungle”. Places like Itegue Taitu Hotel are as meaningful for Addis’ future as “Babur”, the light train which is to be inaugurated shortly. Willpower to taking care of their City’s historical architecture should conform to Addis’s people enthusiastic expectations towards modernity. Defending the most ancient Ethiopia’s hotel and expecting from government the utmost engagement in promoting Addis’ historical heritage means making sure that the Old City’s heart will keep on beating in the “new Africa’s New York”. The action that in the coming months will be taken to mend damages occurred to the landmark which by Lonely Planet is defined “a museum piece full of beautiful old furniture and high ceilings” will be a test bed. Besides being strongly engaged in putting up a skyline worth of the global capital city that Addis is rapidly turning into, is the City’s administration also keen to safeguarding its historical heritage?